LYRAVLOS is a five member ensemble which lies emphasis on the Ancient Greek Music. It was created in 2001 by the distinguished musician Panayiotis Stefos. He approached a small group of experienced musicians who were willing to assist in materializing his ambition which was to shed light on the unknown field of ancient Greek music and to reveal the unique value of this music through a systematic scientific research. It was a difficult task as very few researchers had attempted a similar project both in Greece and abroad. LYRAVLOS is a combination of the names of two very popular ancient musical instruments the Lyre and the Avlos. The Lyre represents the Apollonian element in music as Apollo was the god of knowledge and art and the Avlos represents the Dionysian element as Dionysus was the god of joy, love and wine. The ensemble’s work is characterized by scientific accuracy, a strong sense of responsibility, and respect towards the Greek culture. Free from any obsessions and narrow-mindedness in their approach of the classical antiquity LYRAVLOS has proceeded to a thorough study, revival and presentation of ancient Greek music with unique artistic sensitivity and accuracy. This systematic attempt is of great importance not only due to its artistic value but because of its educational significance. The initial target was to approach the general public. The aim is to highlight the Ancient Greek Culture in an accurate, precise and creative way and to avoid presenting the ancient Greek music as an elitist kind of music or merely as a museum piece. 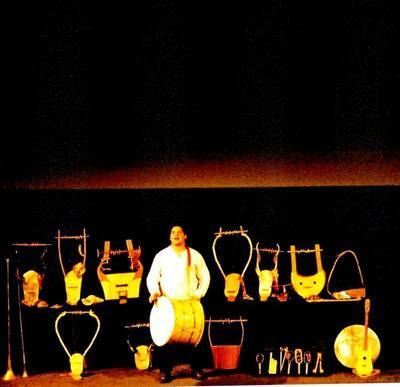 An important part of the group’s work is the reconstruction of ancient musical instruments based on scientific evidence and research concerning the way these instruments were played as well as the use of voice in this music. The ancient instruments manage to reveal unique, mystical sounds that convey the joy of life and motivate the artists to compose modern music thus confirming the inexhaustible wealth, the timelessness and the amazing dynamics of the Ancient Greek Musical Tradition. 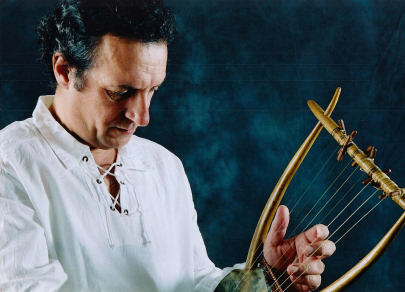 Panagiotis Stefos: ancient guitar, lyre, syrinx, sea shells, double flute , askavlos. Research, orchestration, new compositions and reconstruction of ancient instruments. Michael Stefos: vocals, drums, sea shells. Christina Siaki: lyre, varvitos, pandouris. Olga Stefou: lyre, varvitos, santour, vocals.